Laura Mullen has been doing a lot of crazy things lately. And by crazy, I mean wedding-related poetry performances. She has invited her audience to cut a wedding gown off her body in many cities—Denver, Lafayette, Paris—a culturally fraught version of Yoko Ono’s Cut Piece. 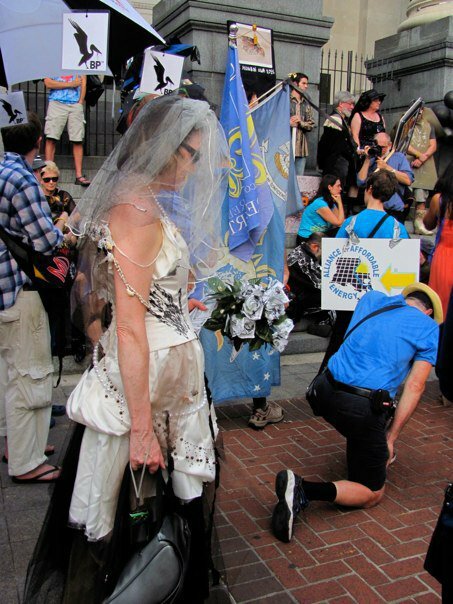 She has worn a wedding dress to a gulf coast oil spill protest in New Orleans. And she has re-sewn a once-cut dress into an awkward, stitched wound of a dress for her “poetry wedding” in Baton Rouge last month. Full disclosure: I was a bridesmaid in her “poetry wedding.” And by “poetry wedding,” I mean the launch for her seventh book, Enduring Freedom. I wore a bright pink dress and, for my contribution to the ceremony, stalked around the seated audience with the poet Afton Wilky, reading/shouting out a list of operation names from the Iraq War. This list is one of the poems in Mullen’s book. When I got to “Baton Rouge,” I paused for effect. When I got to “Church,” I spoke extra loud. 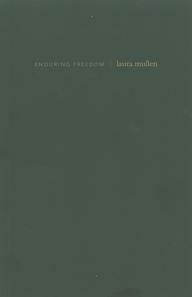 When I got to “Enduring Freedom,” it all made sense. Because a wedding is a kind of war. A war is a kind of wedding. If the parallels aren’t clear yet, they will be after you read Mullen’s book. The voices in these prose poems are crazy, sad, frustrated, frugal, suffering from PTSD (of the war? of the wedding?). They are brides! We know brides. Even if you aren’t/can’t/haven’t yet/never plan to/O yes have been a bride, you know the territory: the gown, the DIY, the invitation, the photography, the gestures, the whole commercialized industry. These poems remind us of the performance of weddings. And that tradition breeds cliché, decay. And the inauthenticity of something proclaiming its own sincerity. “She lowers her borrowed veil as if going into battle and though she knows her skirmish is part of a larger (on-going) conflict any actual confrontation with proof of that fact is dangerous” (28). “The cloudlike dress was contested territory: if silk for a formal wedding “raised the moral of the troops,” as the industry claimed, it was also needed to drop them (softly) behind enemy lines— each wedding gown is a potential parachute. So this slithery whisper as her undone dress slides to the floor conjures other night raids. So both the ‘chute and the dress are bundled up and (like the soldier and bride) disappear after their use. Wadded back into the deployment bag, or stiff in its long box, cleaned and preserved in the “heirloom process.” Our daughter will wear it. Our son will wear it. Out” (44). “Brides are the focus of such outpouring of love and joy […] but nobody cares for the newlywed,” remarks a former bride (49). Ah, and then the soldiers! Their struggles in acclimating to post-war life, PTSD, etc. We settle into the parallel, the difficult reality of it. But things get scarier. Mullen brings to our attention all sorts of uncomfortable ideas besides the overt consumerism and empty tradition of the wedding industry: take, for example, the recent Louisiana oil spill, the landscape as “Mother Earth.” In “Bride of the Bayou,” the speaker exclaims, “But this was a bride once!” Because if the earth is “mother,” she must have been “bride,” right? Who, then, is the groom? Who takes responsibility for the spilling/spoiling? Mullen also touches on postcolonialism, with found text: “If [he] governed India anywhere as competently as he governed/ her body, no wonder everyone lauded his actions/ He ravaged her mouth” (66). There’s nothing pure about these poems; the white dress keeps meaning BLANK. As in: blank history, blank thoughts, willed ignorance, which becomes a unifying theme. and you’re not sure if that applies to a wedding, a war, a natural disaster, or a political movement— there’s a whole hell of a lot that’s being ignored here. Kristin Sanders is the author of the chapbook, Orthorexia (Dancing Girl Press). Her work has appeared or is forthcoming inEveryday Genius, Octopus, Tenderloin, Strange Machine, HTMLGiant, and elsewhere. She currently teaches at Loyola University New Orleans and is a poetry editor at the New Orleans Review. Her newest project is Books I Read By Women.